mail.de, an email provider located in Germany, specializes in delivering highly innovative, secure email services to users across the globe – and for free. Consequently, their IT infrastructure is an extremely varied server landscape comprised of mail, web, database, and even additional application systems. 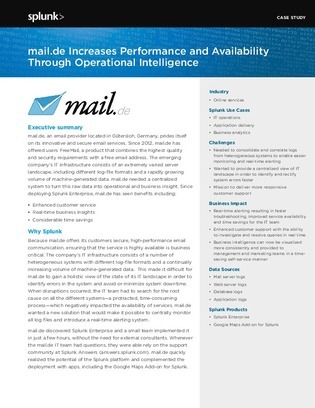 In this quick case study, find out how mail.de built out a centralized, consolidated log reporting and monitoring platform that spanned the entirety of their infrastructure – giving them access to real-time troubleshooting and ultimately increasing user value significantly.